It’s a pretty terrible feeling to realize you drained your cell phone battery playing Candy Crush Saga and don’t have time to put it on the charger before leaving for a meeting. 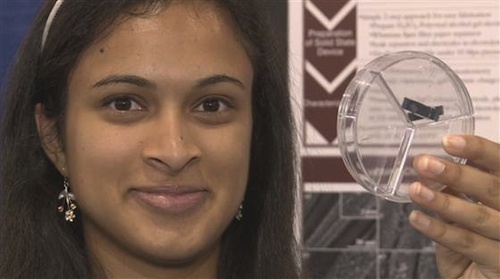 That’s why 18-year-old Eesha Khare is probably going to be a modern day hero with her new invention – a tiny supercapacitor that could charge a phone in 20 seconds. With a primary focus in nanochemistry, the California teen designed the device to fit inside cell phone batteries and hold a large amount of energy in as little space as possible. Many batteries last for 1,000 charge cycles and take as long as an hour to fully charge a phone, but her product lasts for 100,000 charge cycles and fills up in 20 to 30 seconds. Khare has already used it to power a LED light, and believes that its flexible demeanor will also make it a useful piece of technology for fabric and clothing. Her research has earned her a $50,000 prize and the Young Science Award at the Intel International Science and Engineering Fair in Phoenix, Arizona. Her plan is to use the money to pay for college and further her research, which will no doubt lead to a promising and successful future.